Our love is like a ship ………. As you can see, he sneaked away to take a business call. Sigh…yes, I caught him with my weapon…the camera…smile! Seriously…is it worth Rocking the Boat? In this case, NO! Meaning…If one tends to “rock the boat,” he makes trouble or causes problems. The boat will overturn if a person rocks the boat too severely, and that’s dangerous when there are people on the boat. Side note…The third photo in the middle row…Is your dividends paying off like this? I just let out a laugh when I captured this. Are you keeping track of the posts you create? One of the biggest tools I have started this year is an Editorial Calendar! You can create this in Excel or software that is similar. For example: this is a photography, design and inspiration blog. So I rotate these subjects throughout the month. It is also a great way to see what your community is loving and what they are not by adding the stats to the report too if you would like. You can color code and so much more to make it very visual for you to see the direction you are going on your blog. We had a lovely time at the South Seas Resort Marina on a day cruise starting with Captiva Island, even with the hubster conducting business on our date. 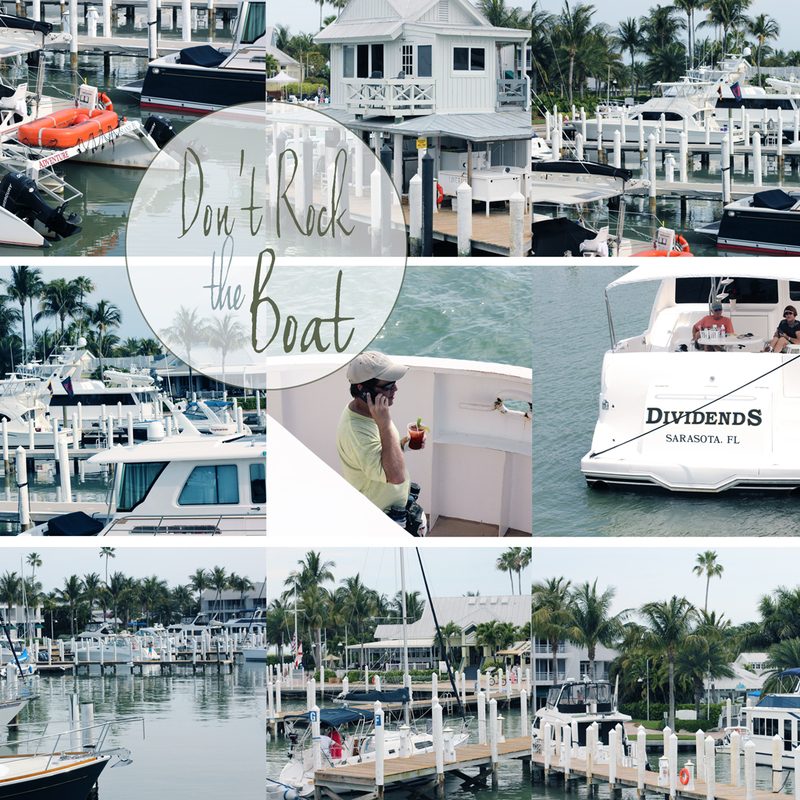 I would love to know what causes you NOT to rock the boat….when you would love to make some waves? go to the bottom of this post and fill out your email.Your inspiration will be delivered directly to you. Love this! Such a great collection of images and a lovely story! Thank you for sharing and for linking up with Tones on Tuesday! What a gorgeous place to go “on a date” …….! I can’t wait until summer! Great images, great post! Thanks for visiting the Mom’s Monday Mingle… I had a blast co-hosting cause I got to find great blogs like yours! Following you here and everywhere. I prefer dancing to rocking the boat 🙂 The song brought back some great memories – thanks! What a fun collage of shots! Looks like you all had an amazing time on the water! 🙂 As for the editorial calendar, I keep trying to implement one, but I never seem to update it often enough. It’s on my list to get on it! What a nice date. 🙂 And I think you just put an earworm in my head. That song, that song! 🙂 Maybe, I will be dancing too after I played the music in youtube..
My dividends have a long way to go…but hey, I have enough to eat, and roof over my head, and this computer – and people like you who follow – thanks so much! That was one of my favorite songs and definitely sums up these photos! You already know this, but you are smart! Sometimes it works to mix business and pleasure. That way a little pleasure gets shoehorned in at least. Nooooooooo! As soon as I read your title I got that song in a continual brain loop! haha. Captiva is on my list of “got to get to’s”. Visiting from Communal Global. The scenes above look picture perfect. So clean and calm and so much well maintained white paint. Very pleasing to the eye. Yup see your hubby on the phone! Very nice blog. Met in Kim’s Beyond Beyond class. Looks like so much fun! Love the name of that boat; too funny! I happened to see it said Sarasota, FL too! I was just there last year! Boy do I miss it! We are going to St. Pete’s Beach this year; can’t wait! What a great idea for the blog… I am completely random. What a great collection, Laurie! Excellent tip on the editorial calendar, thanks! I don’t have one, but now that you mentioned it, I think I will create one for myself too. Thank you, thank you! Thank you so much for the tip! Which one will you recommend? Do they always charge? I use excel, which is part of the Microsoft Office Suite. There is an application that is free called Open Office that is similiar. Thank you again 😉 That’s a cool idea. Thank you! Love the tips you provide. Beautiful photocollection! The textdesign as well.. Would like to visit this place! Now that song is in my head! :). I love how hubby got busted! Looks like a fun day, nevertheless. I could use a little warmth today. Great tips! The boats are making me long for warmer weather! Oh the 70’s… Seems a world away now. Lovely marina – the boats are big, the day warm and the palms reminding us that as it is cool up north still, the Florida days are pleasant indeed! Remember the song well from my collegiate days all those decades ago. Nice views, great memories! Now this is my idea of perfection! Lovely shots, and now that song is singing in my head! WOW, what an awesome day! You’re so lucky to be able to head out on the water, drinks in hand! Looks fantastic. I always get a kick out of what people name their boats too. That’s a funny one. What a great photo collection of boats….we always had boats when I was growing up, I love them. If I was to rock somebodies boat, it would be anyone talking on their cell or texting while driving or crossing a street on foot. What a beautiful boat you have! Enjoy every moment on her! Love your photos! Oh, I wish this was our boat….we are just on a day cruise.